The Duster is the sixth model in the Logan range. SAINT-NAZAIRE, France -- With the new Duster SUV – the first Dacia to be built with a right-hand-drive version – Renault's low-cost brand will debut in the UK in 2012, completing the final piece of the key European market vehicle jigsaw. The Duster is the sixth model in the Logan range that also includes a sedan, station wagon, light commercial van, pickup and Sandero hatchback. The SUV will be badged as a Dacia in Europe, Turkey and Northern Africa and sold as the Renault Duster in Ukraine, the Middle East, Central Africa, South America and Mexico. Like other Logan-based models, options common on many cars, such as a navigation system, are missing from the Duster to lower costs. But the Duster will be the first Dacia with electronic stability control as an option for 300 euros. The Duster is expected to account for a significant percentage of all Logan range sales, Enrico Bill, Renault's marketing product manager, said at a press event to launch the SUV in Saint-Nazaire, northwestern France. 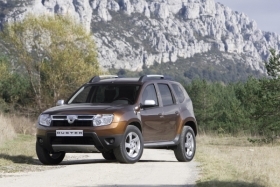 For 2010, the Duster has an initial production capacity of 150,000 units a year out of a total annual capacity of 350,000 units a year at its main production site in Pitesti, Romania. Dacia expects the Duster to build on the brand's global success that has seen sales triple over the past five years to 311,874 in 2009. Dacia is growing much faster than its rivals in Europe. In the first three months, the brand's European sales increased nearly 60 percent to 66,013 compared with the year before, according to ACEA. Czech automaker Skoda's sales grew 5.7 percent to 68,762 while Korean brand Kia's sales were up 25.9 percent to 68,762. General Motors Co.'s Chevrolet –– marketed as a value brand in Europe -- saw sales grow 5 percent to 45,124. Renault launched the Logan range with a sedan in 2004, five years after it bought Dacia, a Romanian automaker founded when the country was ruled by the Communist party. Initially planned only for eastern Europe and other global emerging markets, the low-cost family-sized sedan soon found buyers in western European markets, helped by a consumer shift toward cheaper vehicles during hard economic times. France and Germany are now Dacia's main export markets, with the two countries accounting for 150,000 Logan sales last year. What is the Duster's target group? First-time SUV buyers and second-home owners looking for a rugged, off-road-capable alternative to their sedans. The Duster is also targeted for light commercial vehicle use. Launch date: March in France, Germany, Romania and progressive launch through 2010 in the rest of mainland Europe, Turkey, Africa, and the Middle East. South America and Mexico in 2011. UK in 2012. Main competitors: Skoda Yeti, Suzuki SX4, Fiat Sedici, Daihatsu Terios. Annual production: 150,000 units in 2010. Where built: Pitesti, Romania. Production starts in Brazil in 2011 and Russia and Colombia by 2012. Base price: 11,900 euros in France. Best bits The Duster has full off-road capability with a 30-degree angle from its front to the ground and a 36-degree angle from its back to the ground to reduce the risk of scraping when driving over rocks and bumps on steep inclines. A 210-mm high chassis height also helps to avoid the body scraping when driving over rough surfaces. The 4wd version features Nissan's driving options to prevent the tires from spinning when driving on normal roads or off-road in snow, mud or dirt. What new technology does the car have? The Duster is the brand's first vehicle to offer rollover-preventing electronic stability control as well as under-steer control and traction control as options. When combined with the Duster's four-wheel-drive system, features allow the Duster to tackling off-road driving. What market influences does this car respond to? The company sees the Duster as a new opportunity to expand the Logan platform's market penetration as a low-cost alternative in the SUV market. However, it will mainly gain share against sedans and minivan models from first-time SUV buyers.